I have a toyota truck that I like to take out on trips, many time in the middle of nowhere in the Utah deserts. I ave had an idea to mount a small (10w) panel on the roof to help keep the battery charged when the truck is off. I also want to wire this same unit so the panel will charge a small bank of 10Ah batteries (2 batteries for a total of 20 Ah capacity) that I can use for 12v aux items. My question is: Can I wire the system up so that: Power from the truck battery and power from the solar panel will be going to the same input terminals on the charge controller without ill effects? That way I will always have the small bank of batteries charged and when the truck is off the solar panel will pick up. Or, would I need a battery isolator wired in the system? Your batteries will have different charging perameters. The truck battery is not the same as the deep cycle batts. Correct, this is why I am inquiring. However, I just realized I have an incorrect wiring diagram. There is no ground used the isolator, rather a wire is connected directly to the alternator. My major concern is the very fact that the small DC batteries I have will charge differently. When they are charged fully, will they continue to take a charge of will the isolator be able to sense this and cut power? My guess is they will continue to receive a charge similar to the way the trucks starting battery continues to receive a charge even when it is fully charged. Which brings me back to my question. 2. How much of the gear you're planning to use do you already have? 3. How much money are you willing to spend to power said items, even at the expense of replacing gear you already own? 4. How much "real estate" do you have to mount PV panels? Keep in mind that your proposed PV system, with a 10-Watt PV panel such as this panel, will only provide .59 Amps of current to recharge your batteries. Even assuming excellent insolation of 6 hours of "good sun" per day during your trips, that would only replace about 3.6 Ah of power used by your 20Ah battery bank. If your average daily power demand on these trips is greater than 3 Ah, you'll end up draining your battery bank fairly quickly (inefficiencies in the process will require overhead from that ideal 3.6 Ah/day from your panel). This is simply an exploratory experiment. I am not worried about the small batteries staying charged if I am able to wire it in such a manner that the trucks alternator will be able to help charge them. I am not worried about real estate to mount the panel(s). Not willing to pay much as this is simply an experimental project at this point. The 12v items I will be using are simple lights, small fans and the like. I am not worried about the small batteries staying charged if I am able to wire it in such a manner that the trucks alternator will be able to help charge them. All right, that helps define, at least in a back-of-the-envelope sense, your loads. I've had good experiences with various USB-powered lamps and fans. They typically draw about 500 milliAmps of power at 5V, which comes out to 2.5 Watts. 2.5W/12V = about .21 Amps. 10Ah/.21A = about 47.6 hours, which is how long your 20Ah battery bank could power a single such device, without dropping below 50% state of charge. Meanwhile, 3.6Ah/.21A = about 17.1 hours, which is how long your battery bank could power a single such device, with all power used being replaced by your proposed 10W panel. (3.6Ah*.77)/.21A = about 13.2 hours of solar-powered operation for one USB-powered device, accounting for a reasonable fudge factor of the inefficiencies in your system. For other devices, simply divide the rated Wattage by 12V nominal, then replace .21A in the above calculations with the result. Thank you for the great information. This helps me plan accordingly. However, my dilemma is still how to wire everything properly so as to be able to use the trucks alternator to charge my small battery bank and use solar? 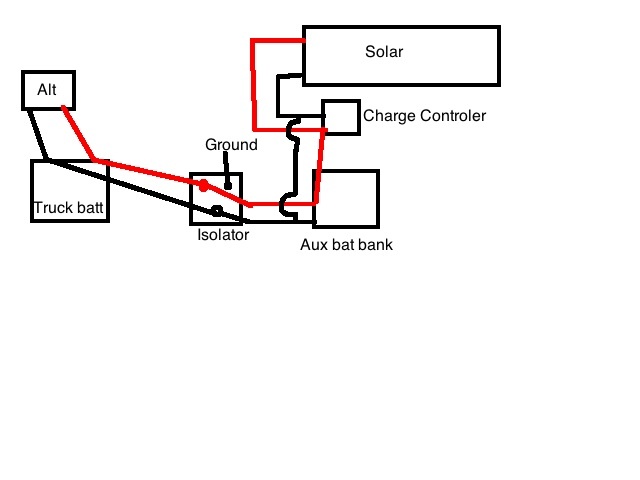 I am thinking if I get a small 85 amp battery isolated and wire it up like any other dual battery system and then wire the solar up as usual, this might be an effective way. You can buy products from the marine/rv market designed to charge two banks, but isolate them when the charger is off. They vary in technique and price. At its simplest is a relay with a voltage setpoint trigger. More sophisticated ones use mosfets and what not. They arent genreally that cheap. For your experiment purposes some switchs and fuses might be more practical, but you will have to watch it a bit more obviouslty. I have a stetling 24to12v 50amp battery to battery charger in my house truck. They do 12to12v also which is what I think vtmaps is referring to. It is an excellent bit of kit but could be a bit large for your small battery bank. My truck has a 115amp 24v alternator 2 x 100ah starter batteries and 2 6v trojans for the house side. When I lived on the road the sterling b2b kept my batteries well looked after. I added a sterling 12v pro charge ultra to look after the house batteries when I could connect to a mains supply, and have recently added 2x 170w pannels through an mppt controller. The sterling equipment is really top quality but does come at a price. I'm glad I went with it I really would recommend their stuff to anyone needing to do the same, but it could be a bit large for your small size batteries. They also do advanced charge regulators to give a proper multi stage charge from an vehicle alternator without using battery to battery. Others maybe able to advise on how suitable any of this would be for you. I can just vouch for the quality of sterling equipment and how well they work. Outback gfx1424e. Victron 350w inverter. I'm planning to use solar panels instead of buying an extra battery and truck accessories while on the road. I found this DIY truck solar panel in Instructables. What do you guys think of this? Personally, I wouldn't rely on double sided tape to mount the panel. I would use SS bolts, washers, good sized backing plates, and seal with butyl tape. A solar panel could work well, but it depends on your loads. Obviously, just having one battery runs the risk of not being able to start if drawn too deeply.